Omar Kahdr's Interrogation Video From Guantanamo. This video is by no means as shocking as the images all have seen of Abu Ghraib. What is particularly interesting is the Comment section which follows the article, which is what this blog is concerned with. Please feel free to comment on the Comments. Kahdr held in Concentration Camp for 5 years without charge. A Canadian citizen born in Toronto, he is the youngest prisoner held in extrajudicial detention by the United States and has been frequently referred to as a child soldier. The only Western citizen remaining in Guantanamo, Khadr is unique in that Canada has refused to seek extradition or repatriation despite the urgings of Amnesty International, UNICEF, the Canadian Bar Association and other prominent organisations. Khadr is the only Guantanamo detainee who has faced a judge and who is not boycotting the military tribunals, and has spent six years in the Guantanamo Bay detention camps charged with war crimes and providing support to terrorism after allegedly throwing a grenade that killed a US soldier. In February 2008, the Pentagon accidentally released documents that revealed that although Khadr was present during the firefight, there was no other evidence that he had thrown the grenade. In fact, military officials had originally reported that another of the surviving militants had thrown the grenade just before being killed. Lawyers for a Canadian prisoner at Guantanamo Bay released excerpts of videotaped interrogations Tuesday, providing a first-ever glimpse into the secretive world of questioning enemy combatants at the isolated U.S. prison in Cuba. The 10 minutes of video _ selected by Omar Khadr's Canadian lawyers from more than seven hours of footage recorded by a camera hidden in a vent _ shows a 16-year-old Khadr weeping, his face buried in his hands, during the 2003 interrogation that took place over four days. The video, created by U.S. government agents and originally marked as secret, provides insight into the effects of prolonged interrogation and detention on the Guantanamo prisoner. A Canadian Security Intelligence Services agent in the video grills Khadr about events leading up to his capture as an enemy combatant when he was 15. Khadr, a Canadian citizen, is accused of throwing a grenade that killed a U.S. soldier during a 2002 firefight in Afghanistan. He was arrested after he was found in the rubble of a bombed-out compound _ badly wounded and near death. 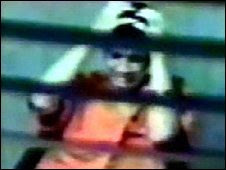 At one point in the interrogation, Khadr pulls off his orange prisoner shirt and shows the wounds he sustained in the firefight. He complains he can't move his arms and says he had requested, but hadn't received, proper medical attention. "They look like they're healing well to me," the agent says of the injuries. "No, I'm not. You're not here (at Guantanamo)," Khadr says. The agent later accuses Khadr of using his injuries and emotional state to avoid the interrogation. "No, you don't care about me," Khadr says. Khadr also tells his interrogator that he was tortured while at the U.S. military detention center at the Bagram air base in Afghanistan, where he was first detained after his arrest in 2002. Later on in the tape, a distraught Khadr is seen rocking, his face in his hands. "Help me," he sobs repeatedly in despair. On the final day, the agent tells Khadr that he was "very disappointed" in how Khadr had behaved, and tries to impress upon him that he should cooperate. Khadr says he wants to go back to Canada. "There's not anything I can do about that," the agent says. The video is believed to be the first footage shown of the Canadian Security Intelligence Service in action during its 24-year history, offering an unprecedented glimpse into its interrogation strategies. The video was made public under Canadian court orders, and released by Alberta-based lawyers Nathan Whitling and Dennis Edney a week after intelligence reports made public last week showed Khadr was abused in detention at the U.S. naval base-turned-prison on the tip of Cuba. A Department of Foreign Affairs report said Canadian official Jim Gould visited Khadr in 2004 and was told by the American military that the detainee was moved every three hours to different cells to deprive him of sleep and familiar cell mates. The report also says Khadr was placed in isolation for up to three weeks and then interviewed again. Whitling and Edney released the video with hopes that public reaction to the footage will prompt Canadian Prime Minister Stephen Harper to lobby for his repatriation. "We hope that the Canadian government will finally come to recognize that the so-called legal process that has been put in place to deal with Omar Khadr's situation is grossly unfair and abusive," Whitling said. "It's not appropriate to simply allow this process to run its course. Video can by viewed by cutting and pasting the following url in your browser. Please leave comments on these Comments, in the comment section of this blog.